The razor-sharp Benoni Defence is a fascinating opening and an ideal choice for players with a love for tense, tactical positions. Both sides have a multitude of tactical shots and ideas at their disposal thanks to the asymmetrical pawn structure, with Black�s play generally focusing on the queenside while White tends to combine play in the centre and on the kingside. 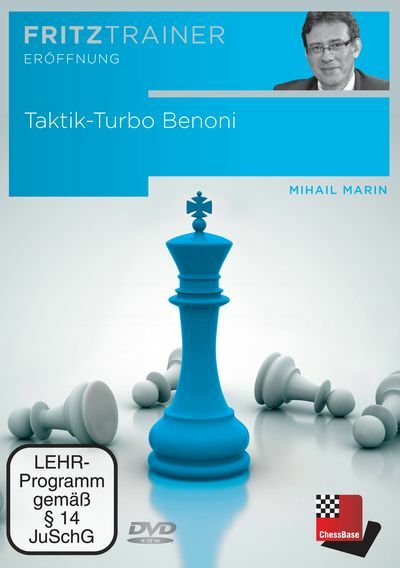 On this DVD, Mihail Marin presents the major tactical themes and options available for both sides in the Benoni. Based on an interactive format, which prompts users to solve a range of training questions by inputting moves, the well-known theoretician and Grandmaster invites you to take part and challenge yourself with a training course aimed at delivering a structured, intensive and systematic approach to learning the key positions in the Benoni as well as knowledge of a number of the defence�s tactical finesses. In addition to the interactive tactics course, the DVD also includes a database with a large number of (mostly annotated) sample games - meaning that you also have plenty of material to reinforce the tactical motives covered in the videos. Video running time: 4 hours 45 min.